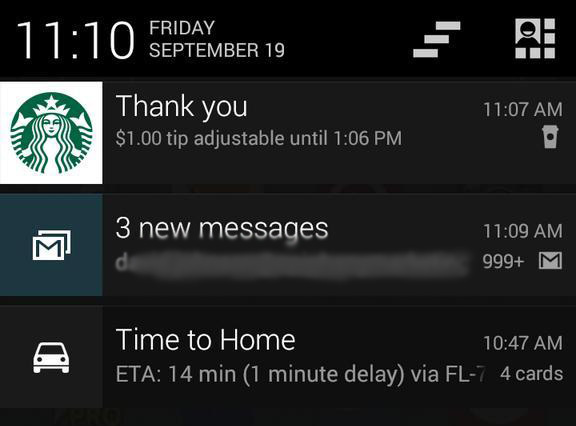 A couple of weeks ago, I got an email from Starbucks letting me know that their Android app was about to get a refresh. This was good news, because for months now the iOS app has provided users the ability to tip right from inside the app. Since I never carry cash, I almost never leave tips—something I’d be more than happy to do. The new version of the app was made available a couple of days ago, but today was the first time I’ve made it to a store to test out the tipping function. The app has a beautiful new UI, which I checked out right away after updating to the new version. Onboarding inside the app was easy and intuitive. The email a couple of weeks ago had warned that you’d need your password handy upon updating as login would be required. No problem for me, as I’ve been in the habit of reloading from inside the app, which (thankfully) requires the password anyway. So today I visited one of my local stores and checked out with the app as usual. This time, a notification appeared offering several options for a tip: $.50, $1.00, and a third option that equaled the balance I had on the card (I was close to needing to reload, so it was under $2). The notification also prompted me that tipping would be available until a time that worked out to be 2 hours after my transaction. As you can see, the app also allows you to modify your tip if you accidentally bumped the wrong amount. Nice touch! All in all, I’m very happy with the new app, although I was a bit wary of the new permissions required. Thankfully, I’m using cyanogenmod, so I have the ability to block permissions at a much more granular level, thanks to Privacy Guard. I’ll take a closer look at those shortly. One other pleasant surprise, for the first time, updating the Starbucks app didn’t cause the “Default Card” setting in my account to get goofed up. That was a mildly irritating “feature” of virtually every other previous version of the app.